Backblaze offers an economical and easy solution to backup unlimited data to the cloud. With only $50 per year per computer, we think Backblaze is by far the most sensible personal online backup. Learn more. Backblaze, established in 2007, is considered one of the hottest choices for online backup services. 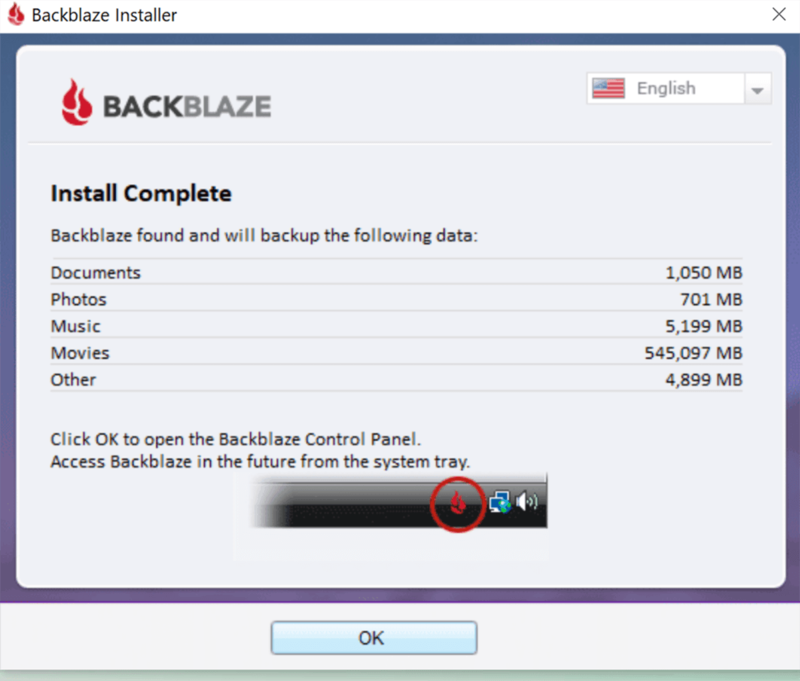 How much does it cost to use Backblaze? Granted, it isn’t the best solution for cloud storage (see pCloud for that instead). Still, with 600 Petabytes GB stored and over 30 billion files recovered thus far, it really is the best choice for simple and convenient backing up of your computer files. 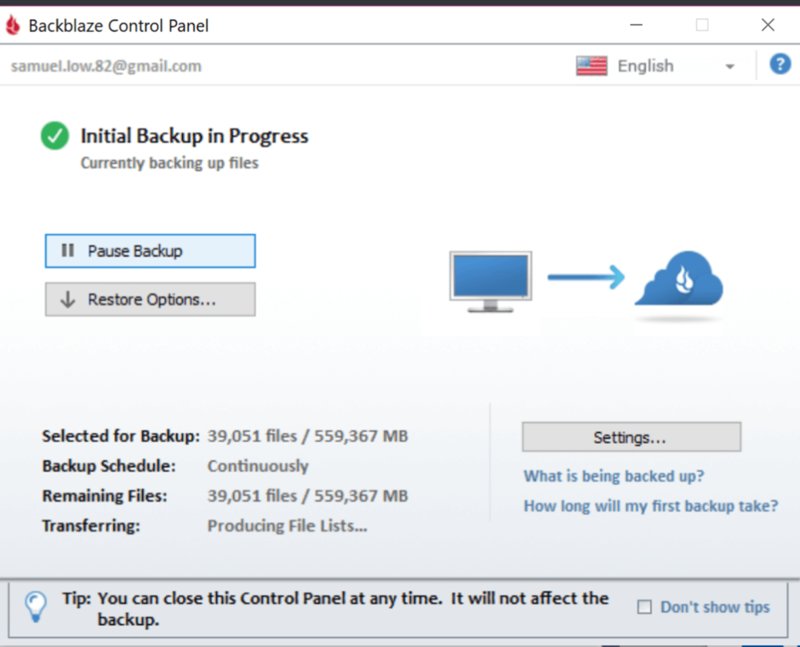 What makes Backblaze a worthwhile backup cloud storage provider is how it is engineered specifically for simple usage with all the necessary basic functions that doesn’t require much work on the user’s part. Backblaze’s strength lies in the simplicity of its design. When you first install the programme, it immediately scans your hard drive for all files (except for operating system files, applications and temporary files which may cause complications when trying to restore them) and gives you an overview of the files to backup. When you click “okay”, it then proceeds to automatically back it all up for you so you don’t really have to do anything except let it work its magic. By connecting any USB or external hard drives, it can also connect it automatically during initial backup or you can plug them in later and add them from the settings. Best of all, Backblaze monitors your computer and updates the backup files anytime there are changes, all while maintaining a minimal presence on your computer so it doesn’t interfere with whatever else you are doing. On the flip side, if there are any files you prefer not to have backed up, you can specify which folders to exclude from being fed into cloud storage. Otherwise, it will just make it easier for you by taking everything. In short, if you’d rather not go through the hassle of having to manage your files, Backblaze makes it very easy for you. Whether you have just 1 Megabyte or tons of Terrabytes of files, Backblaze has no issue backing it all up for you. Considering that most backup services come with a space limit, this is an invaluable feature for the price you are getting (more on that later). Now depending on your network and computing speed and the size of your files, it could take a few hours or even a few weeks. The good news is that no matter how long it takes, Backblaze just keeps on going behind the scenes to ensure your files are completely and wholly stored. When you run your initial backup, there is a button that reads: “How long will my first backup take?” which will give you a forecast. As long as your computer is on (or even if you shut it down and turn it on later), it will continue to finish the first backup process until it is complete. 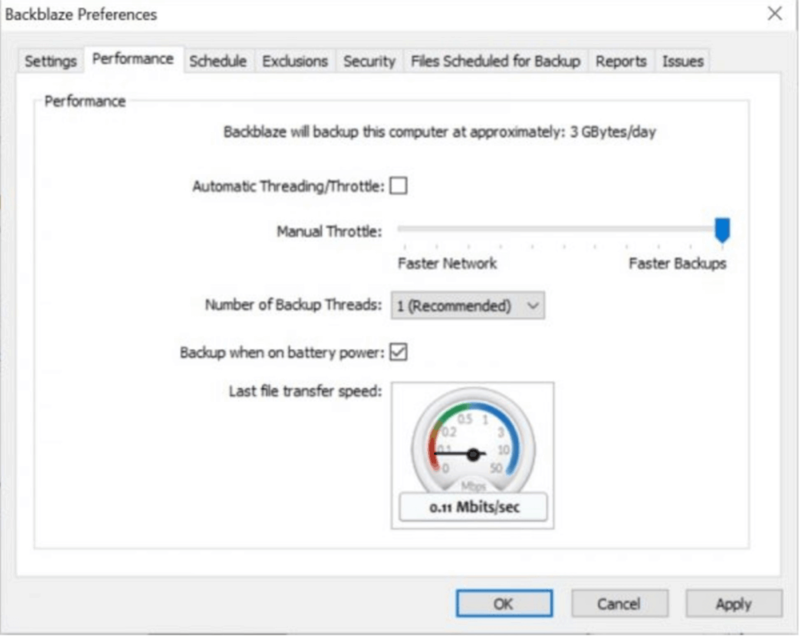 Alternatively, you can also speed things up by increasing the number of backup threads you have running or adjusting the throttle settings manually. Backblaze works well as a cloud backup service! Backblaze encrypts all your files with the standard AES 128-bit, which is generally uncrackable. It is estimated that it would take a supercomputer several billion years to break it. Besides that, any would-be eavesdropper are kept at bay with file encryption being done on your computer before being sent in transit with SSL. Within the data centre itself, multiple copies of your files are stored on multiple servers so that if one copy should be corrupted, there are numerous other backups available for you. 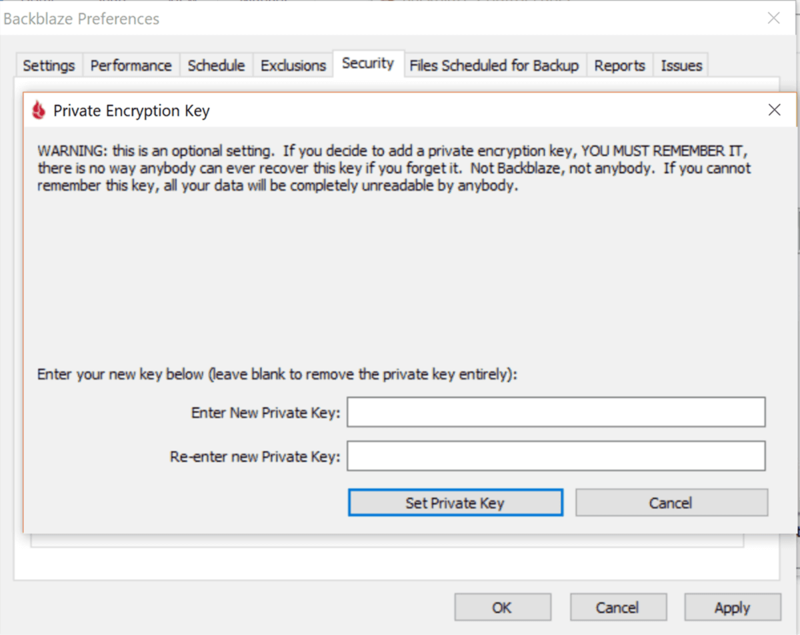 If you still need something more, Backblaze offers you the option of a private encryption key at the “Settings -> Security” tab of the desktop programme. This allows you to set your own password to access your files which only you will know (with one precaution: If you forget it, you may lose access to all your data so Backblaze provides a notice to caution you to be sure to remember it). And if you are worried that your password could be hacked or stolen, you can also enable two-factor authentication (2FA). What that means is that if a login to your account happens on an unrecognised device, the system will send a security code to you via text or using Google Authenticator to ensure that it is you before granting access, like a TAC code when you do an online transaction at the bank. So rest assured, your data is very safe and secure. The point of having a backup is to be able to retrieve your files if your physical hard drive go bust. The most common way to restore via Backblaze is via zip file and you are able to request 500GB at one time with five simultaneous requests. But of course, these things take time and depends on your network. Another alternative way is to use the mobile app to download and/or play the files you wish to access. You can share files as well but it is limited to the device’s built-in sharing options. The quickest way for restoration is through Backblaze’s courier delivery service which can send you an external hard drive. You have to pay a deposit upfront but you will get a refund when the hard drive is returned. For smaller bits of data, pen drives can be supplied. Backblaze doesn’t just help you protect your data. It also helps you protect your computer where your files are stored as well. 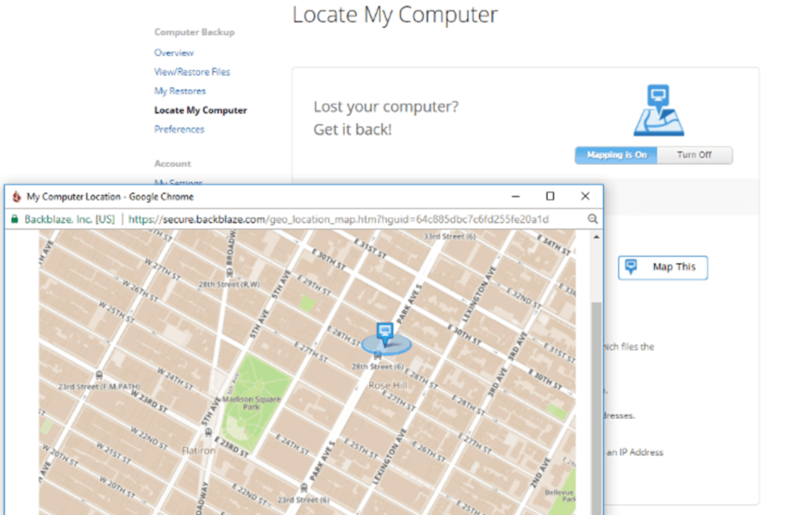 Since your account subscription is tied to one computer, the Backblaze website has a Locate My Computer function that allows you to access your computer’s physical location in the event that your computer is misplaced or even stolen. This function also provides details on the most recently backed up files, the current ISP serving the computer and its IP address. In the event that you fear that your stolen computer’s data may be compromised, you can even use SOS Online Backup that includes the option to remotely wipe all data from your computer to keep your information safe from data thieves. During normal office hours in the US (9am – 5pm Pacific Time), you can interact with customer support via online chat. Alternatively, there is also an trackable email system that usually gets a response within a few hours along with the option to track your ticket status. Backblaze’s simple functions limit it as just a simple computer backup service. 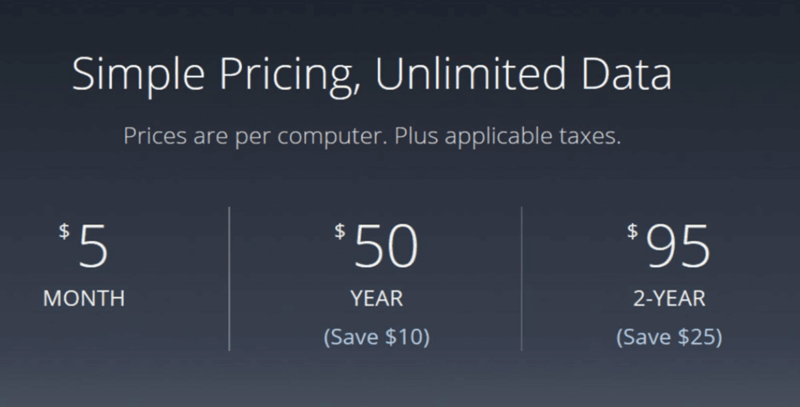 Subscription is limited to one computer per account only. If you are using a private password and you forgot it, the data in your subscription is permanently locked without any chance for retrieval. Previous versions of your file only last up to 30 days before it is erased. Mobile applications cannot be used to sync files with your account. As simple as the product, Backblaze’s pricing structure is very straightforward. With long term subscriptions, you only rack up $3.96 in monthly expenses which is the most affordable out there. See the pricing structure here. For the person who wants an economical and easy solution to backup their data, most warmly! Requiring minimal input from the user, top notch security at an affordable price and the option of asking for an external hard drive to restore all your data if your computer is broken down or stolen, it is an excellent backup service. Still, because one account is limited to one computer, you will have to consider multiple accounts for all your computer units, especially if you have a family or a business to run. So again, yes Backblaze is highly recommended as the cloud backup for your computer. * No credit card needed for free trial. ** Plan includes unlimited cloud backup, crazily tight security, file versioning & more.